Perfect for rainy day and cold day. Living so far from India makes you crave for few snacks a lot. One of them is Mung daal pakoras avaiable easily frpm market hawkers. So this is my version of Homemade Mung daal Pakoras...yummy..want more every time. Grind the soaked daal and make it thick batter add water if it is really thick. Add salt to taste, turmeric and eno while grinding so that it mixes well. In the mean while in a deep dish pan add 3 cups of oil for frying the fritters. Now when the oil is hot take a small ice cream scooper (1 tbsp size) and dip in warm water. Keep on dropping the batter in oil. Do small batches. Keep dipping scooper in warm water in between so that batter does not stick so much. 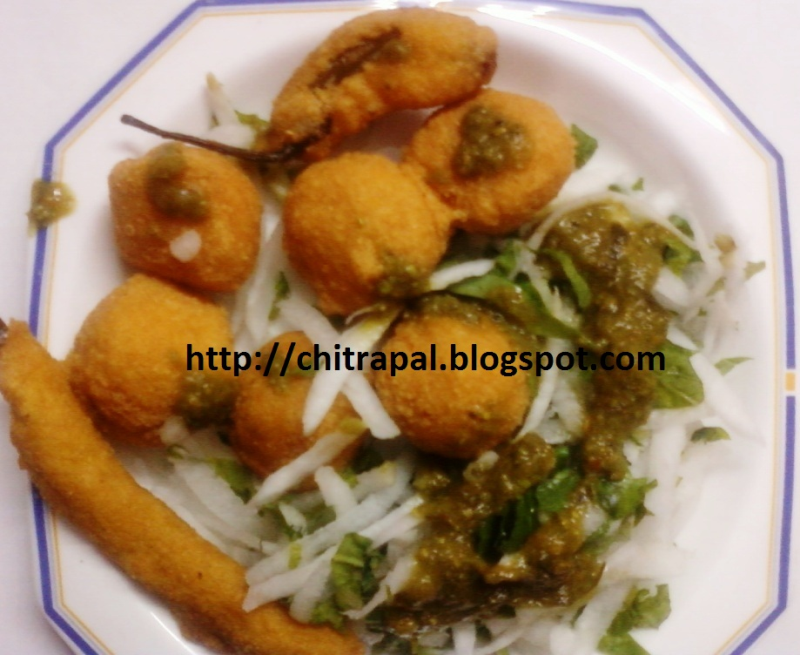 Now dip green chilies in the batter and fry them too. Serve them hot with grated reddish and chopped mint leaves on sides and spicy mint chutney and some sweet chutney. this is what my wife crave so much as we stay here in leeds may be we can make here. thanks to you and rabz that we make good fusion food here and enjoy our time here.